Founded in 1894 (some sources say 1892) and incorporated in 1895, the A. L. Blackmer Company prospered until 1908 when financial difficulties forced the company to reorganize as the Blackmer Cut Glass Company. A. L. Blackmer, the firm’s founder, served both companies as treasurer and manager. He was previously employed by the Mt. Washington Glass Works “in various positions” during which he learned the glass trade. Blackmer designed most of the company’s rich-cut patterns, but he also employed an assistant. He himself was partial to geometric, rather than realistic, patterns and they were the mainstay of his company. Only toward the end of its existence, after 1910, did the company introduce realistic patterns. Earlier, realistic pattern-names, such as Iris and Pansy, were used, but the patterns are strictly geometric. 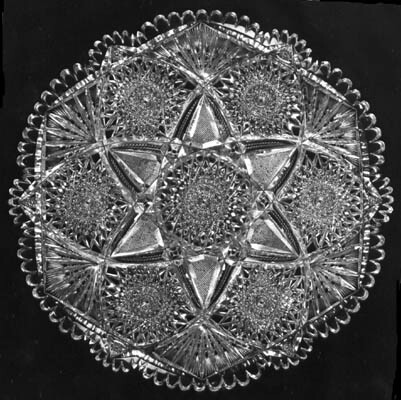 A. L. Blackmer was well-known for the perfection of his “final polish.” It was claimed that his cut surfaces “could be made no smoother or more lustrous than the original surface” and that his cut glass had “a glistening surface long considered practically impossible” [to produce] (Jeweler’s Circular, 18 Dec 1895, p. 5.) The process that resulted in this glistening surface was called “gem,” about which nothing is known (obviously it was a trade secret). Given the date, the process probably involved chemical (acid) polishing. Although A. L. Blackmer preferred glass that was “all cut,” economically he had to acknowledge the emerging popularity in the glass trade of the “figured” blank after about 1905. He did this in 1911 by issuing a catalog of cut glass that used these blanks. But he was careful to keep such glass separate from his catalogs of quality cut glass (The Crockery and Glass Journal, 31 Aug 1911, p. 14). An example of Blackmer’s catalog of glass cut on “figured” blanks has yet to be found. It should be mentioned that Revi also supplies a photograph (p. 64) that shows three pieces of Blackmer cut glass that then, as now, were owned by the Corning Museum of Glass. Unfortunately, the pattern on the vase, while a Blackmer pattern, is incorrectly identified by Revi as the Constellation pattern. (Pearson follows Revi and also misidentifies this pattern as Constellation in his ENCYCLOPEDIA, Vol. 1, p. 104.) This unknown pattern is also shown in an ad placed by the glass merchant J. D. Dithridge in the China, Glass & Pottery Review of March 1901, p. 38. Dithridge was representing Blackmer at this time. Unfortunately, the ad does not name the pattern. The champagne glass and the “lemonade glass” in Revi’s photo are both cut in Blackmer’s Columbia pattern, a pattern that was, for many years after 1900, pictured on the company’s billhead. Originally Revi wrote that the champagne glass’ pattern was “unknown.” However, a check of the Corning Museum of Glass’ Glass Object Data Base indicates that Revi later identified the pattern as Columbia. The Museum’s data base also shows that the incorrect identification given the aforementioned vase was, in fact, made by Revi and not by the Museum. The vase, champagne glass (goblet), and lemonade glass (tumbler) have the following CMG accession numbers: 61.4.115, 116, and 117. High-quality patterns cut by Blackmer during the early twentieth century include Sultana, Lyndale, Nordica, Princess and Zephyr among several others, including the Columbia and Estelle patterns which are considered below. In common with most other cut-glass manufactures, the Blackmer company was adversely affected by marked changes in popular taste after 1910 as well as by increasing competition and the approach of the First World War. By 1916, it was necessary for A. L. Blackmer to liquidate his company. He remained in the cut-glass business, however, and for a period worked as a salesman for the Hunt Glass Company of Corning. Arthur L. Blackmer died in 1937. None of the Blackmer designs were ever patented. 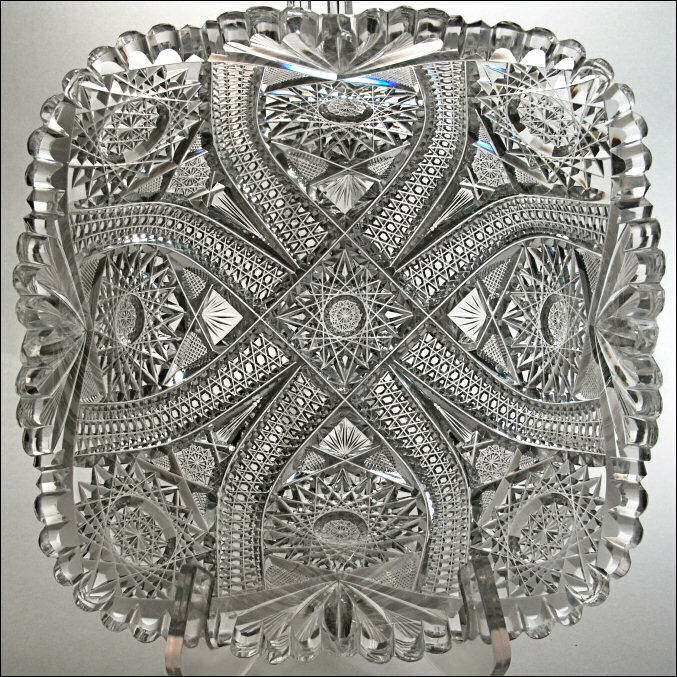 Twenty-plus years ago the writer was fortunate to find, not far from where he was then living, two superior examples of Blackmer cut glass: the company’s “signature” pattern, Columbia, and the Estelle pattern. The Columbia example was found on a pitcher, shape no. 207, at an antiques show in Boston. It sold for $475 in 1984. The Estelle ice cream tray, below, materialized in a shop in southern Rhode Island in 1982. This design, which was introduced by 1905, is one of the company’s most brilliant. It is shown in the company’s 1906 catalog as well as in the January 1905 issue of China, Glass & Pottery Review, p. 37. Neither the Columbia pitcher nor the Estelle ice cream tray were identified by their respective sellers as Blackmer Cut Glass. Ice cream tray or plate cut in the Estelle pattern on shape no. 283 by the Blackmer Cut Glass Company. D = 13.75″ (34.9 cm), wt = 8.25 lb (3.8 kg). Sold for $850 in 1982. A twin to this tray was advertised for sale by a recognized dealer in American cut glass during the summer of 2004 for $4,250. Blackmer CatalogsIn the late nineteenth and early twentieth centuries, the Blackmer company produced books of photographs of its products for customers who were unable to view the items first-hand in New Bedford. Thus, it seems likely that the company’s first printed catalog was delayed, perhaps as late as the 1906 catalog listed here. This catalog was soon followed by other printed material, all of which is available in the Rakow Library, either as hardcopy or in microform. [1906 Catalog] A. L. BLACKMER CO., HIGH GRADE CUT GLASS. Prepared for the 1906-7 season. 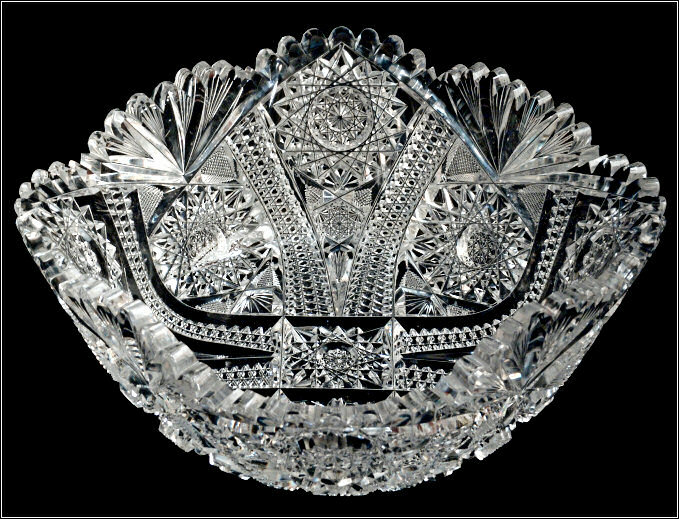 An American Cut Glass Association reprint. Originally copyrighted by J. Michael Pearson, 1982. 92 patterns on 47 plates. [c1908 Catalog] A. L. BLACKMER CO., RICH CUT GLASS. The date 1908 is inscribed by hand on cover. 73 patterns on 24 plates. Most of these patterns are also available in the previous catalog. Reprinted in Smith (2004c). [Two c1910 Catalogs] BLACKMER CUT GLASS. These two catalogs, referred to as “A” and “B” by Smith (2003), who has reprinted them, were once owned by Gladys Blackmer, A. L.’s daughter. They are now at the New Bedford Whaling Museum. The catalogs can be dated as having been printed after June 1908, when the company’s name was changed from the A. L. Blackmer Company to Blackmer Cut Glass, but probably before 1914, when the company appears to have published its final advertisement — a realistic pattern, Lilly-of-the-Valley, that is realistically rendered. This pattern is not found in either of these two catalogs. Because the catalogs are loose-leaf compilations, and because they share a couple plates that are identical (except for plate numbers), it is not possible to assign a specific date to each catalog. The period 1908 to 1914, or c1910, will have to suffice.